Masks are associated with ancient rituals, frequently of passage or transformation. The images conjured by the word are often carved wooden pieces of African origination. Now at the Brooklyn Museum in Disguise: Masks and Global African Art, many fine examples of these old world artifacts (or at least traditional in style, as many are from the 20th century) are on view, alongside contemporary renditions of masks, whether literal or more figurative. It's a stirring juxtaposition and a showcase for some intriguing young artists, many based in Brooklyn. Pieces from Liberia, Nigeria, and Cameroon exemplify the traditional type using materials organic to the geography, such as wood, straw, and leather. They can evoke animals, and are often meant to be fierce, intended to veil or erase one's identity. The works by current artists play on the varied themes and functions presented by masks, adapting them with an eye to contemporary issues of identity and security. Many of the artists have moved to New York from African countries. Among the most compelling is Nandipha Mntambo, who focuses on bullfighting. She transforms herself into not only a toreador, photographed in costume, waving a red cape in a bullring, but also an intimidating bull with horns. In another fascinating work, she takes a cowhide and shapes it into a relief of a woman's backside, bridging abstraction and representation. 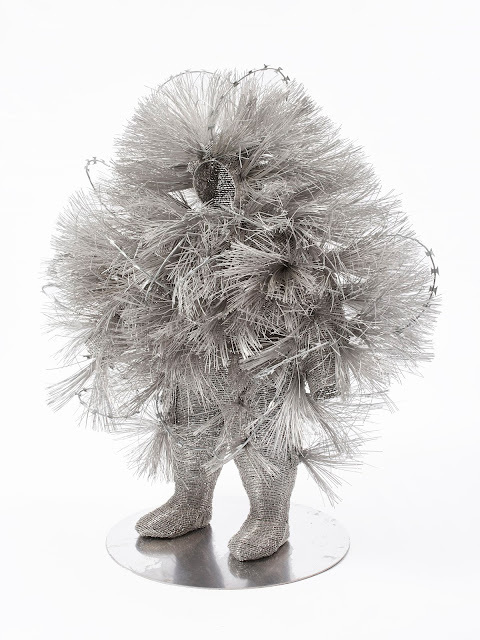 Walter Oltmann of South Africa creates bristling body suits of razor wire and metal spokes, like modern versions of suits of armor. While obviously threatening, they manage to be endearing, in the way of a hedgehog. Brendan Fernandes, From Hiz Hands, 2010, neon, glass. 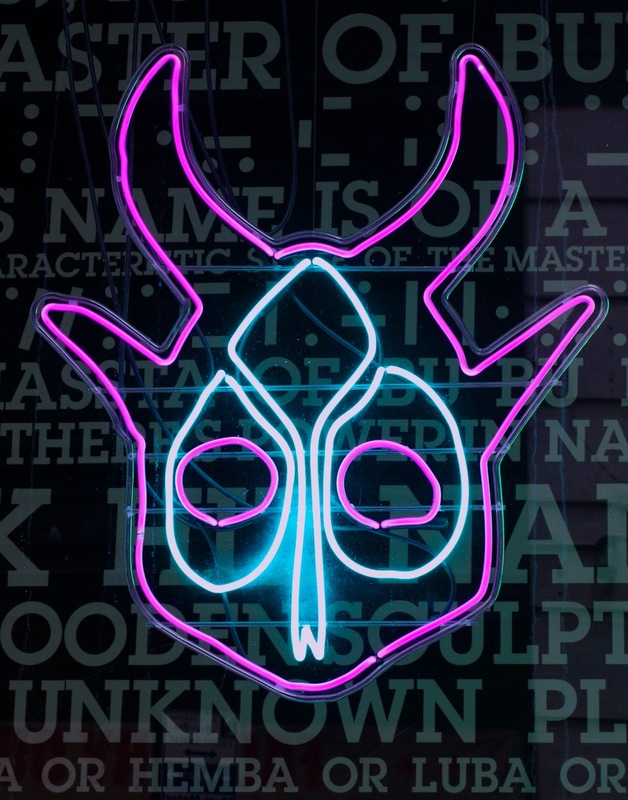 Brendan Fernandes makes masks out of modern materials such as neon tubing and plastic, and sets them upon underlying, shadowy text, or, engrossingly (and disorientingly), on decoys of deer. He raises questions about the human need for disguise, and how it often is enacted for psychological reasons, rather than simply for the basic need to survive. In As One, he filmed ballet dancers posing in relation to African masks, juxtaposing symbols of divergent traditions. Zina Saro-Wiwa's photographs are striking because they show a woman in contemporary fashionable dress grappling with a giant mask/headdress, paralleling how descendants deal with the acts and histories of their predecessors. She also elicits questions about feminism, as traditionally predominantly men participate in rituals with large and heavy masks. 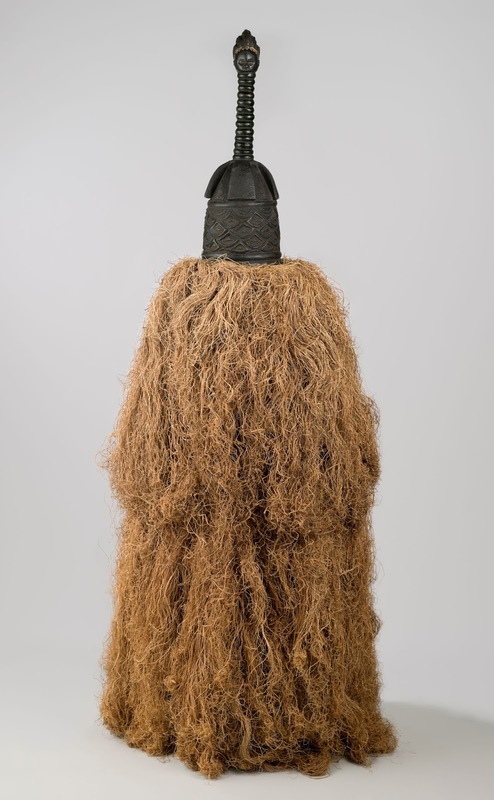 Disguise: Masks and Global African Art , which originated at the Seattle Art Museum, is on view through September 18. Also in the lobby is an installation by Tom Sachs of his Boomboxes over the years, constructed of found or repurposed objects. Photos courtesy of the Brooklyn Museum unless noted.